C1480. 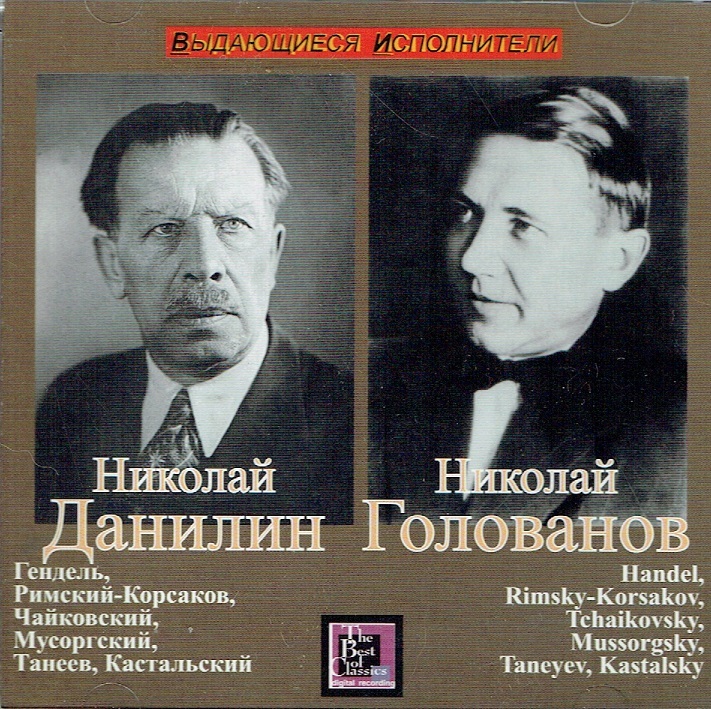 NIKOLAI GOLOVANOV & NIKOLAI DANILIN Cond. USSR State Symphony Orchestra & Republican Russian Choir, w. M. Maksakova, mezzo-soprano, A. Korolev, bass: Choral Works by Handel, Rimsky-Korsakov, Tschaikowsky, Mussorgsky, Taneyev & Kastalsky. (Russia) Aquarius AQVR 335, recorded 1938-47. “Golovanov was born in Moscow on 21 January 1891 and died there on 28 August 1953. This was one year after he was stripped of his chief conductor role at the Bolshoi, the fate of those who fell from Komsomol favour. “Golovanov conducted the premiere performances of a number of works, among them Nikolai Myaskovsky's sixth symphony in May 1924, and recorded operas and concert works by Glazunov, Mussorgsky and Liszt among others. Golovanov held some of the highest musical positions in the USSR, including an extensive association with the Bolshoi Opera. In her autobiography, Galina Vishnevskaya terms him the theatre's chief conductor, and tells of his dismissal from the Bolshoi and his death - which she attributed to the humiliation of the experience of losing this position. It has been reported that Golovanov's firing was the result of Stalin's displeasure at Golovanov's having tried to use a Jewish singer, Mark Reizen, in the title role of Tsar Boris Godunov in his recording of Mussorgsky's opera. 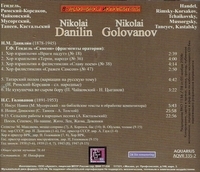 Golovanov actually did record the opera with Reizen as Boris, but later remade Reizen's part with another Boris, Alexander Pirogov. Golovanov's recorded output was substantial and quite individual in interpretive approach. In his discography we find all but one of the Liszt tone poems, the complete Scriabin symphonies and Piano Concerto, Tchaikovsky's 1st and 6th symphonies, as well as shorter works, Beethoven's 1st Symphony, Violin Concerto and Triple Concerto, Rimsky-Korsakov's SCHEHERAZADE and his operas SADKO and CHRISTMAS EVE, Mussorgsky's BORIS GODUNOV and PICTURES AT AN EXHIBITION, Rachmaninoff's 2nd and 3rd symphonies, plus the opera ALEKO and other compositions, Glazunov's 5th, 6th and 7th symphonies, and scores by Grieg, Mozart and others. Based upon the evidence of his recordings, Golovanov's characteristic performance mode was full-blooded and nearly vehement in tone, with a powerful, almost overloaded sense of sonority, and extreme flexibility in matters of tempo, phrasing and dynamics. Golovanov was also a composer; his works include the opera PRINCESS YURATA, symphonies, two symphonic poems, orchestral suites, overtures on Russian themes, over 200 Romances, arrangements of folk songs, and a number of choral religious works. He was a well-regarded piano accompanist in the early years of his career. He was married to the soprano Antonina Nezhdanova."